MATH – This lesson allows students to look at historical maps used in steamship travel to solve mathematical problems, finding the midpoint in ocean crossings. In order to solve the problems featured in Midpoint in Ocean Crossings, use this formula below. 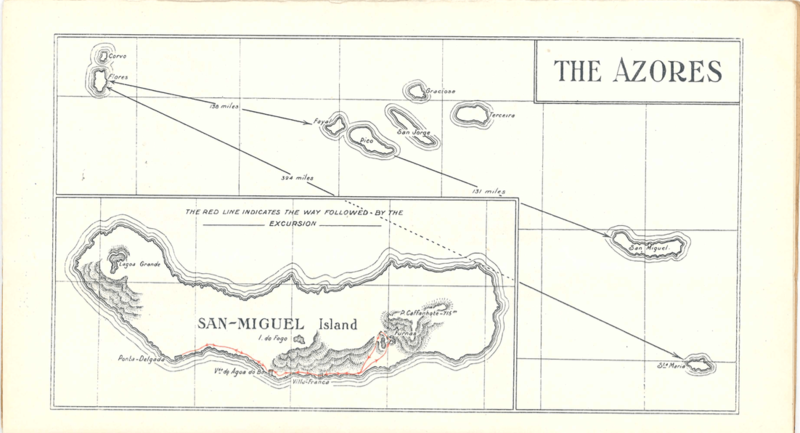 A map of the Azores from the Fabre Line Winter Cruises brochure 1923-1924, SSHSA Archives. Distance from Santa Maria to Flores = 324 miles. Distance from Flores to Fayal = 130 miles. Problem: Find the midpoint the steamship traveled from Santa Maria to Flores. Problem: What would the midpoint be on a trip from Santa Maria to Fayal with a stop in Flores? Geometry, Finding Distances and Midpoints, Math Planet. Algebra, The Distance and Midpoints Formulas, Math Planet.